Map 12 North Fife Hills. Walking distance Luddaw Hill 0.5 km, Forret Hill 1 km, Myrecairnie Hill 0.5 km, Norman's Law 2.5 km. Purpose The excursion is designed to examine (1) examples of the Lower Old Red Sandstone Ochil Volcanic Formation lavas of North Fife (2) the vents from which they may have been erupted and (3) a Lower Old Red Sandstone intrusion. Between St Andrews and Cupar, Lucklaw Hill forms a prominent mass 190 m high, 3 km north of the main A91 road. It is all the more conspicuous on account of a large quarry in its south face in which can be seen, even from several kilometres distance, the bright pink Lucklaw Hill Felsite. The felsite is regarded as an intrusion, possibly laccolithic, cutting the andesite and basalt lavas of the Lower Old Red Sandstone. The intrusion may have been a feeder for the adjacent lavas, though there are no rhyolite flows in the neighbourhood. A similar rock is exposed at Peacehill Point 4.5 km to the northwest (Excursion 5). A microgranodiorite intrusion, also cutting the lavas, forms most of Forret Hill 6 km NNE of Cupar while Myrecairnie Hill, 4 km north of Cupar, is composed of breccia and is tentatively believed to be part of a volcanic vent. Norman's Law, 7 km north-west of Cupar, comprises basalt and andesite lava flows and a few metres of grey, mica-rich, tuffaceous sandstones. Route Proceed from St Andrews via the A91 to Guardbridge, then by the A919 for just over 1 km before turning left onto an unclassified road leading past Leuchars Station, for 2 km, to Balmullo. Cross the A92 at the village hall and after 200 m turn north for 0.5 km to Quarry Road which leads west to Lucklaw Quarry [NO 419 213] of the Fife Redstone Company. It is necessary to wear a safety helmet and to obtain permission to enter the quarry before proceeding. This forms a mass, of irregular outline, about 1.5 km in diameter and, where exposed, with vertical margins. To the north, Armstrong et al. (1985, p. 43) have described a breccia of lava fragments in a felsitic matrix. This, they suggest, may be a down-faulted part of the roof of the felsite mass. In the quarry the main workings are at a higher level, reached by a road leading west from inside the quarry entrance. At this higher level, the bulk of the felsite is an orange-pink, fine-grained rock with phenocrysts of orthoclase, plagioclase and rare biotite. In places the rock is banded and on weathering, purplish patches appear. Locally in the quarry, the felsite is pale grey in colour. Jointing, though conspicuous and often consistent for tens of metres in the quarry, does not appear to follow any systematic pattern, varying from vertical to horizontal. Veins of barytes up to several centimetres wide occur and are accompanied by very small quantities of green malachite. Other veins, 1–3 cm across, are pale grey in colour and formed of cryptocrystalline quartz. Some joint faces reveal dark brown dendritic markings generally believed to be of manganese dioxide. Microscopically the felsite comprises phenocrysts of orthoclase and plagioclase in a fine-grained quartz and feldspar groundmass. The rock is described by Armstrong et al. (1985) as a rhyolite. Return in the bus to the A92 and proceed south for 2 km before turning west on an unclassified road signposted for Logie. At the T-junction after 2 km, turn left for a further 2 km before turning north on an unclassified road signposted to Kilmany. After 1.5 km park the bus and walk 200 m eastwards along a track to the quarry [NO 388 200], readily seen from the road, in the south end of Forret Hill. This mass is one of four intrusive bodies cutting the Lower Old Red Sandstone volcanics in the Cupar area of north-east Fife. It is 1.5 km from north to south and lkrn from east to west with the principal component a microgranodiorite. This rock type is well displayed in the quarry where it shows N–S vertical banding and jointing parallel to and close to the western margin of the body. The intrusion is regarded as a boss by Armstrong et al. (1985, p. 43), having vertical contacts with the country rocks. On a fresh surface the rock is medium grey in colour with conspicuous feldspar phenocrysts up to 2 mm long. A purplish hue appears with weathering and the rock occasionally displays a curious vesicular appearance. In thin section the rock can be seen to comprise plagioclase feldspar phenocrysts and pseudomorphs after pyroxene and magnetite in a quartz and alkali feldspar matrix (Armstrong et al. 1985). The country rock andesite is exposed about 300 m north of the quarry just beyond a swampy stream which crosses the rough track leading north and upwards from the quarry. The outcrop, which is about 30 m above the fence, is of purplish, unusually hard, compact andesite which may have been baked in proximity to the microgranodiorite boss. Continue north in the bus for 2 km to Kilmany, turn west onto the A914 for 2 km to Rathillet, then turn south for 2.5 km to Hillcairnie Farm. Leave the bus and walk east through the farmyard (ask permission at the farm) and beyond for another 200 m before a branch of the track runs 50 m south to a quarry in a small wood [NO 367 185]. The Geological Survey map (sheet 48E) indicates that Myrecairnie Hill may be a volcanic neck though no boundaries to it are exposed. The rocks within it are displayed in the Hillcairnie Quarry and comprise pink and cream coloured felsite fragments together with purplish lava fragments. Armstrong et al. (1985, p. 37) record fragments up to 2 m across and note silicification as common. Fragments are more usually a few centimetres across, but this is hard to gauge in the quarry on account of the lichen cover over much of the rock surface. Rock from the quarry seems, however, to have been used in the walls of the farm buildings and although now weathered, a better idea of the fragmental nature of the rock can be gained by examining blocks in the walls on the way back to the bus. Similar rocks crop out on Kilmaron Hill to the south-west and both hills are tentatively marked as volcanic necks on map sheet 48E. An alternative explanation offered by Armstrong et al. (1985, p. 37) is that they are altered volcaniclastic sediments. If volcanic necks they are likely sources for part of the very large thickness of Lower Old Red Sandstone volcanics in North Fife. From Hillcairnie Farm return north to the A914 and turn south-west for 3 km before turning north-west to Luthrie village and beyond. After 1.5 km pass on the western side of the village of Brunton to just beyond Pittachope Farm and park at the entrance to a track [NO 309 209] leading south towards Norman's Law, the conspicuous hill 1 km to the south. Armstrong et al. 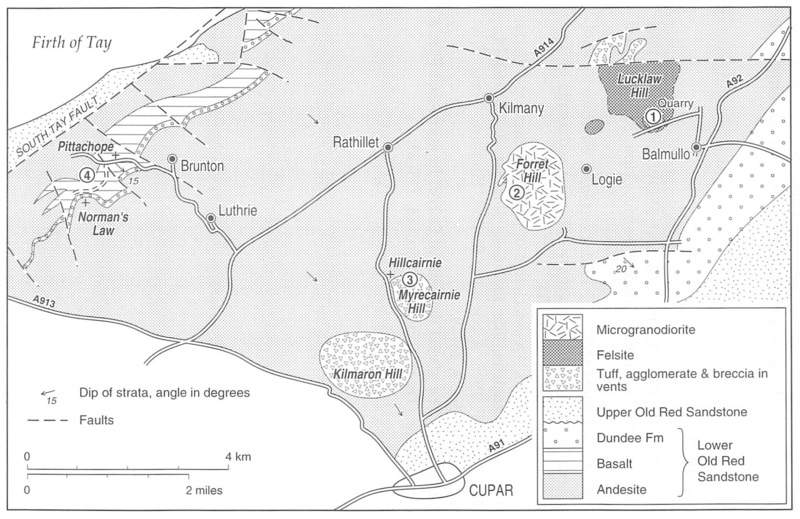 (1985, p. 21) have indicated that the Ochil Volcanic Formation of the Lower Old Red Sandstone reaches a thickness of 2400 m in the area north-west of Cupar. This locality affords an opportunity of examining some of the lavas together with the landscape resulting from their folding to form the south-east limb of the Sidlaw Anticline. This anticline was later eroded to produce dip and scarp slopes over an extensive area in the North Fife Hills. Within 50 m up the track the first of three lava flows forming cliffs up to 3 m high on the left of the road is reached. The lavas are purplish in colour, vesicular and often so weathered as to be crumbly. In some parts minor faulting can be seen. These flows have been identified as basalts. In the second flow examples of autobrecciation can be seen where blocks, up to 15 cm across, of the lava's early formed vesicular crust have been incorporated into the still fluid parts of the flow forming a breccia. The vesicles contain dark green chlorite, calcite, zeolites and agates (in different areas); others are empty. Follow the track uphill to the second cattle grid. Fifty metres before the grid the basalt is fresher and shows poor columnar jointing. Leave the track at the small gate on the south side beside the cattle grid. Notice the conspicuous scarp face of Norman's Law with prominent columnar jointing east of the summit. Walk 200 m almost due south to the western corner of a pine plantation and join a rough track there running to the south-east. Follow this for 175 m to a small gate on the eastern side where an ill defined path runs east for 120 m along the fence to a quarry [NO 311 201]. Here, medium-grained, well bedded grey sandstone dipping at 15° SE is exposed displaying minor cross bedding and conspicuous white mica on some bedding planes. About 4 m of sandstones, overlain by 2 m of dark grey siltstones, are exposed. This sandstone and the overlying, unusually thick (130 m) hypersthene–andesite lava can be traced for at least 15 km along the strike of the North Fife Hills, with Norman's Law as the highest of several conspicuous summits formed from this flow. In each case the north-west face is marked by strong columnar jointing, characteristic of the middle of the flow, while to the south-east is a more gentle dip slope. Return to the small gate and then follow the ridge to the summit of Norman's Law, at 285 m the highest of the North Fife Hills [NO 305 202]. Notice the contrast, in this south-east dipping lava, between the scarp face, controlled by columnar jointing, and the dip slope in which jointing parallel to the top of the flow plays a major part. 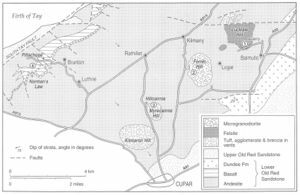 Hypersthene-andesites from the North Fife Hills have been described (Armstrong et al. 1985, p. 40) as containing hypersthene which is usually replaced by chlorite or serpentine. Other phenocrysts include rare altered olivine and rare plagioclase feldspar which also makes up the groundmass. From the summit on a clear day, there are extensive views of the regional geology. To the east are the series of summits, with their dip and scarp slopes, formed of the same hypersthene–andesite flow as forms the summit of Norman's Law. To the south are the twin volcanic necks of the East and West Lomonds and also Largo Law, another volcanic neck. To the west lies the valley of the River Tay with Kinnoul Hill in Lower Old Red Sandstone lavas and sediments with, far beyond, the Dalradian rocks in Ben Vorlich. To the north lies the Firth of Tay and the Carse of Gowrie where Upper Old Red Sandstone and Carboniferous sediments have been downfaulted between the North and South Tay Faults. They are overlain by late-glacial clays and the postglacial Carse Clays. Beyond are the Lower Old Red Sandstone volcanics of the Sidlaw Hills, dipping to the north-west into Strathmore on the north-western limb of the Sidlaw Anticline. Beyond these, the Grampian Highlands, composed of older Dalradian metamorphic rocks, are seen. The summit shows the remains of a first millenium ac hill fort with a series of 'defensive enclosures' (Walker and Ritchie 1987, p. 167). Descend the western end of the ridge past good columnar jointing in the lava before turning north to reach the track where it enters the plantation north-west of Norman's Law. One of the basalt flows beneath the sandstone is well exposed at the roadside 75 m west of the point where the track enters the plantation. Such basalts usually contain olivine, now replaced, and plagioclase feldspar phenocrysts in a groundmass of plagioclase feldspar and tiny augite crystals. Walk east back down the track to rejoin the bus. Take the bus back through Luthrie to rejoin the A914 and follow this for 2 km south-west to the crossroads with the A913. Take the A913 for 6 km south-east to Cupar and from there the A91 back to St Andrews. ARMSTRONG, M., PATERSON, I. E. and BROWNE, M. A. E., 1985. Geology of the Perth and Dundee district. Mem. Br. Geol. Surv. Sheets 48W, 48E, 49. WALKER, B. and RITCHIE, G., 1987. Exploring Scotland's heritage, Fife and Tayside. Royal Commission on the ancient and historical monuments of Scotland. HMSO, Edinburgh. This page was last modified on 23 February 2019, at 17:43.